Our next stop after El Louza was the Kerkennah Islands. 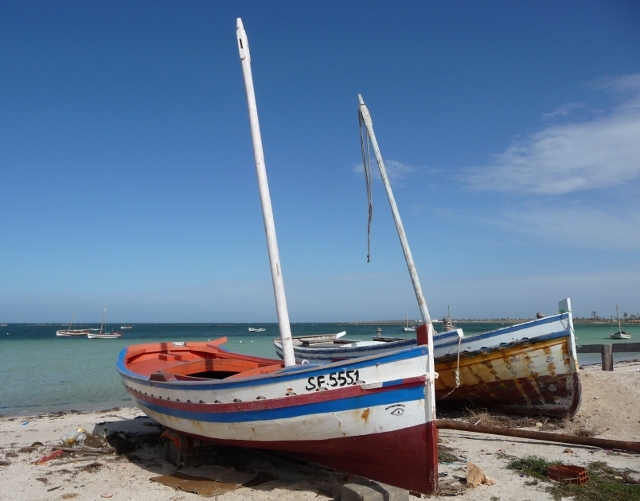 These tiny islands lie an hour by ferry off the coast at Sfax, so it was back on the road south from El Louza. It took us a little while to figure out how to buy a ticket for the ferry or even when the next one was, having just missed one. After an hour or so, all became clear and we drove onto the ferry to the front of the open car deck. 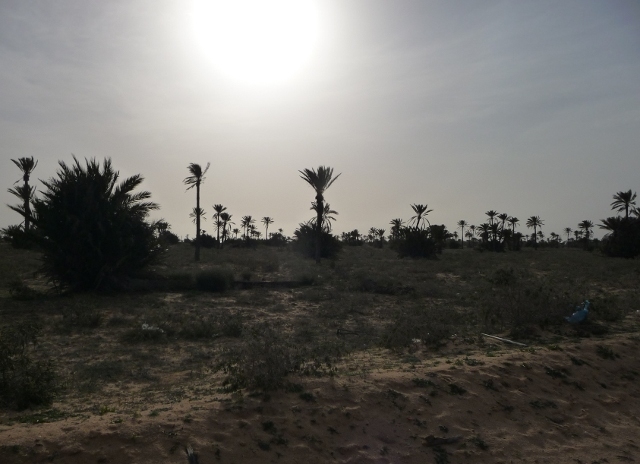 It was a blowy crossing, but the sun was shining as Sfax disappeared in the distance. After about 40 minutes, and not seeing land, the boat stopped abruptly and started turning. Thankfully it didn’t return to Sfax, the captain was just making a left turn presumably due to shipping channels and sandbanks. The sea is very shallow in this region. We were relieved to spot the islands in front of our new direction. They are low lying slivers of land, not reaching more than 13 metres above sea level at their highest point and about 30 miles long. Their separation from the mainland means that the local customs and traditions are slightly different, but it is essentially a berber population. It has also served as a place of exile, illustrious figures include Hannibal and former president Habib Borguiba. As the boat neared the dock, all the foot passengers crowded the front of the car deck making it difficult to return to the van, and then to drive it off when we arrived. There seemed to be a competition to see who could be first off! There are two main inhabited islands and several uninhabited ones. These two are joined together by a bridge. Our first impression was of a flat desert island with a multitude of palm trees. This landscape was punctuated by salt flats. There was a strange charm about the place. There wasn’t much on the first island apart from this, so we crossed over to Chergui quite quickly. There was a small coastal Zone Touristique, where all the hotels were. We were headed for a hotel with camping, but it appeared closed. 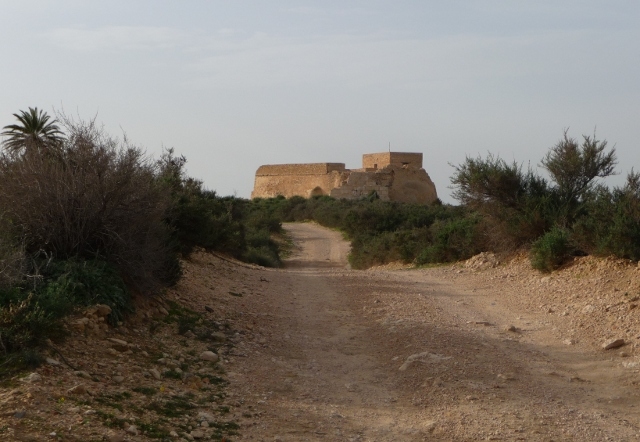 Just down a dirt track from this stretch we found the ancient fort Borj El Hissar. Its honey-coloured stone basking in sunshine above the turquoise sea. We had read that there were also Punic/Roman ruins to be seen below the fort and that the guardien was friendly. We parked the van and headed up the stone ramp into the fort itself. The guardien, Mohamed, greeted us like the long lost travellers we sort of are and insisted we come and drink herb tea with him. He led us into a little room in one wall and poured glasses of exotic tasting sweet tea. He had whole bunches and branches of herbs drying on the table and tried to get me to name them in English. Apart from Rosemary, the others are a mystery. There was music playing on the radio, the lilting melody transported us into a timeless interlude that could have been now, 2012, but could easily have been centuries in the past. After a few glasses of tea had been pressed on us, Mohamed lead us through the gates at the side of the fort and gave us a guided tour of the ruined settlement with the usual cisterns, baths and walls. It was a wonderful setting, and although more tea was offered, we said we had to move on to look for a campsite. Mohamed waved his hand in the direction of the shoreline and said that people often camped there. So into Remla, the one slightly bigger town, for some supplies and then back out to our wild spot for the night. There were a few people around but we felt safe and no one bothered us. After dark, two sets of car lights suddenly appeared over the rise and we were visited by the local police, with the police chief of Kerkennah himself in fact. They were really friendly and welcomed us to the islands but would rather we didn’t camp, it wasn’t safe, the country was still unstable and so on. They didn’t move us on though, and provided us with the emergency numbers for their station and the one at Sfax should we have any trouble. Their concern made us slightly edgy about being there, but equally reassured that we had friends in the right places. We passed a peaceful night and set off to explore the outer reaches of the island. Although it is a holiday destination, the island remains largely unspoiled, but there isn’t a whole lot to see, and less to do off season. We stopped off at the museum in El Abbasia, which is usually closed on a Friday. The curator welcomed us warmly. He had a small group of Algerian women museology students on placement and insisted on giving us a full guided tour with them in tow. We felt a bit like royalty. The museum showed traditional life on the islands with tableaus of various quality showing the sponge divers and fishing techniques as well as other crafts. It was interesting to see, but the tour went on a bit, especially as the curator kept stopping to answer his phone! By now we had decided to leave the islands, having done the main points of interest and with nowhere legitimate to camp. On the way back through Remla to the ferry port, we were flagged down by our police friends who enquired about our night. We also stopped to pick up our delicious lunch snack – metabka or berber pizzas which are rounds of hot soft unleavened bread with a spicy tomato and vegetable filling. Luckily our van wasn’t too far forward on the car deck on the return crossing as it got very wet and blustery with huge amounts of spray coming over the front and sides of the boat. Back into Sfax, and it was a long drive to Gabès, further southwards.